On signing up to our Email Campaign Creator we will create your user account and send you your login details to access your Campaign Admin Centre. We will also design and create your unique email template in continuity to your existing web site look and feel. Once your account has been set up you can start targetting your customers. 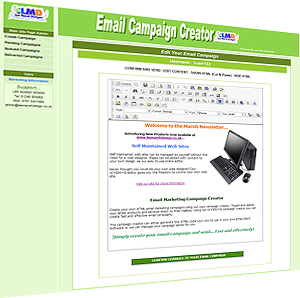 Businesses spend vast amounts of money targetting new business and neglect their existing ones... With Email Campaign Creator you can target both - cost effectively! Access your Email Campaign Editor Admin and begin designing your campaigns to attract sales and boost turnover. Our WYSIWYG campaign editor makes it so simple to create your professional HTML emails you can be delivering your sales pitch within minutes. The editor tool allows you to add images to your content and even link back to your main web site to give recipients the opportunity to purchase your services and products online. All images are hosted within your Admin Centre to ensure they are displayed to your recipient. Once you have designed your Email Campaign simply preview it in our Campaign Preview facility to ensure you have included all the content and elements you wish to send. We provide two options for despatching your Email Campaigns to suit your budget and requirements. Option #2 - We can manage your email campaign delivery for you. 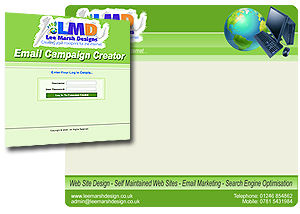 Simply design and create your Email Campaign and choose Deliver. We will despatch your campaign to your managed database of recipients. We will also manage your unsubscribes removing them immediately to prevent resends. Drive Sales To Your Web Site... 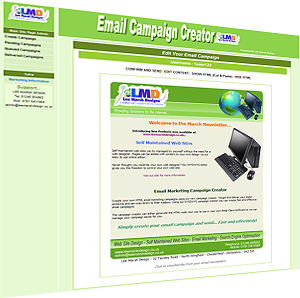 It Couldn't Be Easier than with LMD Email Campaign Creator! © Copyright 2019. Lee Marsh Design. All Rights Reserved.